What if you swapped Batman with Aquaman in BvS? You get a Hero Swap. Episode 3 of Hero Swap brought to you by our friends at Klomp! Animation. Aquaman is a fictional superhero appearing in American comic books published by DC Comics. Created by Paul Norris and Mort Weisinger, the character debuted in More Fun Comics #73 (November 1941). Initially a backup feature in DC’s anthology titles, Aquaman later starred in several volumes of a solo title. During the late 1950s and 1960s superhero-revival period known as the Silver Age, he was a founding member of the Justice League of America. In the 1990s Modern Age, Aquaman’s character became more serious than in most previous interpretations, with storylines depicting the weight of his role as king ofAtlantis. Aquaman has been adapted for screen many times, first appearing in animated form in the 1967 The Superman/Aquaman Hour of Adventure and then in the related Super Friends program. 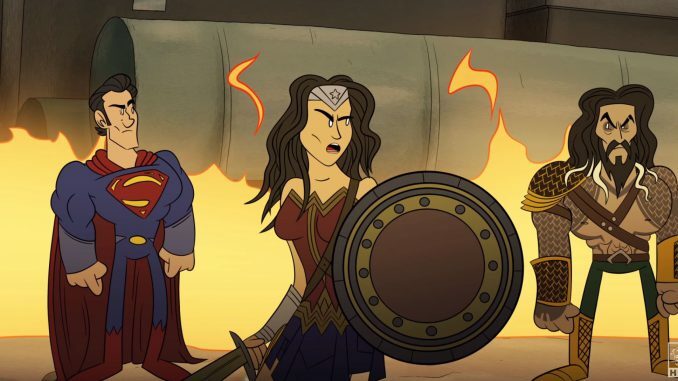 Since then he has appeared in various animated productions, including prominent roles in the 2000s series Justice League Unlimited and Batman: The Brave and the Bold, as well as several DC Universe Animated Original Movies. Actor Alan Ritchson also portrayed the role in live action in the television show Smallville. Jason Momoa portrayed the character in the 2016 film Batman v Superman: Dawn of Justice (2016) and will reprise his role in the DC Extended Universe, including a solo film in 2018.